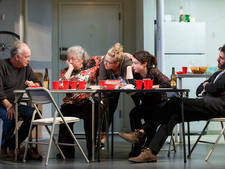 I've been reading several reviews from several very well respected theater critics in and around New York City about The Humans, a new Broadway show, since it has transferred from the Laura Pels theater Off Broadway recently. Critics from The New York Times, The Washington Post, New York Magazine and Chicago Tribune have all said very positive things about The Humans. The Humans, a Roundabout Theater Company production, recently opened on Broadway at the Helen Hayes Theater on February 18th. The Humans is a new play written by Stephen Karam and Directed by Joe Mantello. With the same 6 member cast that opened the show Off Broadway, this 90 minute comedy-drama primarily focuses on a strong family as it faces various crises in their lives, among them issues involving money, possible job loss as well as relationship issues. The show tells us about a man by the name of Erik Blake from Pennsylvania, who brings his family to New York City to celebrate the Thanksgiving holiday at his daughters apartment in downtown. Although there is a great deal of comedy in this show, as darkness descends on the pre-war "badly in need of repair" apartment building, the mounting pressures of the family members reach a boiling point exposing true feelings for all to see. They seem to be struggling to "live life to the fullest". Although I have not personally seen The Humans myself, as soon as I return to New York City from my vacation, I intend to get to the Helen Hayes Theater to catch a performance. Everything I hear and read about The Humans is very positive. If you need advice, want to talk about this show or any of the fantastic shows playing on Broadway in New York City, I hope you'll consider a call to Applause-Tickets.com when you have a few minutes to talk. Applause-Tickets.com is open 24/7 to assist anyone needing advice on which shows to consider buying tickets to, where to sit in the theater or even what great restaurants might be a good fit for you to try before or after the Broadway Theater. Right now Applause-Tickets.com is offering The Humans tickets at significant price reductions thanks to "special discounts" it receives from the show. Let us know how we can assist you in obtaining The Humans tickets or possibly another Broadway show you may want to see.